Beijing has recently successfully completed a test flight of its largest high-altitude airship. China has reportedly conducted a 48 hour test flight of its largest high-altitude airship, the Yuanmeng (Dream) in near space–the atmosphere between 20 kilometers to 100 kilometers altitude–IHS Jane’s Defense Weekly reports. 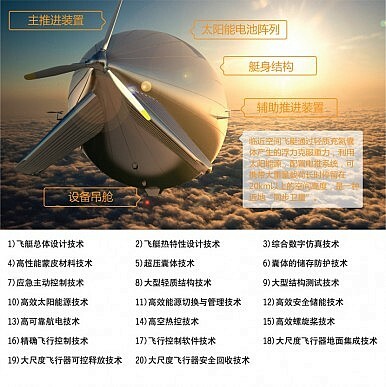 A Chinese scientist involved with the project told Want China Times that the airship has been made of an extremely lightweight material capable of enduring tremendous pressure and that it is equipped with a highly efficient solar battery and lightweight avionics. “The biggest challenge for the near-space airship is the big temperature difference in the day and night,” another scientist told The People’s Daily Online. The airship has purportedly been designed and built by Beijing Aerospace Technology Company and the Beijing University of Astronautics and Aeronautics (BUAA) first and foremost for civilian purposes such as weather monitoring, estimating crop yields, and disaster relief assistance. During a future conflict where China’s satellite communications are blocked or satellites, in fact, destroyed through anti-satellite weapons, the Yuanmeng could as a communications relay station for Chinese aircraft and ships. Operating higher in near space means that the Yuanmeng would have constant line of sight over a hundred thousand square miles–an important requirement for radar and imaging. Increased sensor coverage means increased warning time against stealthy threats such as cruise missiles, giving Chinese forces a greater opportunity to detect and shoot down such threats. It would also be harder for fighters and surface-to-air missiles to attack near space objects. While the airship will be vulnerable to missile attacks and other types of anti-satellite weapons, the Yuanmeng, equipped with sensors, could nevertheless serve as an early warning system in a future high-tech conflict. In particular, it could supplement China’s burgeoning anti-access/area denial capabilities by detecting incoming missiles, stealth planes, and warships from several hundred kilometers away. Is China Fueling an East Asian Arms Race? China’s military technology and weapons development are a reality check for regional security.